We came across a very free and frank interview with Rakesh Jhunjhunwala where he has given vent to his internal feelings and these feelings range from his initial career days struggle to the views and anguish during Bombay blasts which targetted the Bombay stock exchange. The interview is as appended below and the sutradhar for this interview is Anuradha SenGupta and it must be admitted that Rakesh Jhunjhunwala has given a very polished and frank opinion which can have a lasting impression on the stock market traders. Rakesh Jhunjhunwala has made his fame and fortune by calling the markets right. How he has gone with a starting capital of Rs 5,000 to a net worth of a few thousand crore rupees is now the stuff of urban legend. One of the big bulls of the stock market, Jhunjhunwala is quick to point out that he is bullish first and foremost on India's growth story. For the chartered accountant who bet big with the Madhu Dandavate budget of 1989, Bombay Stock Exchange is where it all started. Anuradha SenGupta: It's 9 o'clock in the morning and we are outside Bombay Stock Exchange (BSE). Do you feel sentimental, when you pass by this road? This is where you started your career about 20 years ago. Rakesh Jhunjhunwala: I can tell you Anuradha, I started here in 1985. Anuradha SenGupta: You have been saying hello to a lot of people here. Rakesh Jhunjhunwala: I know a lot of people here. I had no office here; I used to come here with a bag. We used to get a ticket to enter the ring. I couldn't get the permission, so I used to stand outside the ring and see trading take place. And that's how I learnt. And I remember how I struggled and how I raised money. It's a moment of great happiness. There was a samosa-wala here, right there in the garden and we used to eat samosas. Lovely samosas he used to make. There was a bomb blast in the BSE and I was in the ring on the day of the blast. And two of the samosa-walas died here. We had 12 exits from the ring. There was such panic after the bomb-blast. And I was afraid of a stampede and kept shouting, "Don't worry, if we die, we'll die together. Don't try to save only yourself." And I saw a view in the gallery ring. Glass broke off and a person's head got cut in the ring. Very vivid and tragic memories of that day. But this street really reminds me of how I used to come here. Anuradha SenGupta: Everyone saw how Mumbai, how the stock exchange, was back to its feet so quickly after the blast. Now is there something about making money, about trading and business that is linked with this survival instinct? Rakesh Jhunjhunwala: You know, trading always keeps you on your feet, it keeps you alert. That's one of the reasons why I like to trade. Anuradha SenGupta: What are these attitudes in life that you have got from your profession? Rakesh Jhunjhunwala: First thing I've learnt is that markets work. They are the best mechanism to build societies. Anuradha SenGupta: You are philosophical about what you do, isn't it? Rakesh Jhunjhunwala: I am passionate, I don't know whether I am philosophical or not. I am observant surely. Anuradha SenGupta: The India shining story, are you the face of that story, Rakesh Jhunjhunwala? Rakesh Jhunjhunwala: Well, that's not for me to say. I entered the market at Index 150. Today, the index is at 12, 000. It's eighty times. And you know, I too could have gone abroad, I am a qualified chartered accountant. I could have practiced. It's a fact that a person who started in 1985 in India in stock markets, could meet with success. Which speaks for the volume of opportunities available here. Anuradha SenGupta: Today, every move you make, every investment you make, every stock you put your money on is tracked, there are people who jump into the bandwagon, whether you like it or not. Does that pressurise you? Rakesh Jhunjhunwala: See Ma'm, I've no clients except my wife because I don't want to be answerable to anybody. But with her, I've no choice. Anuradha SenGupta: Does it pressurise you, this performance anxiety? Like if I am a cricketer or a soccer player, and if I start performing well, there's always an expectation that every time I go into the batting field, I'll score a 100. Look at what's happening to Sachin Tendulkar?. Rakesh Jhunjhunwala: But Ma'm, whether anyone's watching or not, I'm always paranoid about all my actions. And the likelihood of my actions being successful, say five years ago, or ten years ago or today, is only better to the extent of what better experiences I've had. I am fearless. I am not concerned about what people think. I am only concerned about my deeds. Anuradha SenGupta: You are an icon, when it comes to someone who's successful at the stock market. Are there lot of Bunties and Bablis who want to become Rakesh Jhunjhunwala, you think? Rakesh Jhunjhunwala: I do get mail from a lot of people, who say they want to invest in markets, and follow my career path. What did I do, they want to know. Anuradha SenGupta: Ordinary investors, retired people. Do you think there's an understanding that they want to be educated or they just want to make a quick buck? Rakesh Jhunjhunwala: See, markets are about money, but markets are also about knowledge. Markets are also about egos; markets are also about the satisfaction of having been proved right. Especially, when that right is from an original thought and not from a guided source or following somebody. So I feel the anxiety, curiosity and the anxiousness to know about the market; it's quite general. But markets being markets, the ability is quite limited in my opinion. Anuradha SenGupta: Greed and fear, you said, are the two traits that have to be balanced. How does one balance them? Give us an anecdote, where you had to balance it. Rakesh Jhunjhunwala: Anuradha, it's like this. Suppose I invest in Titan. I bought 'x' number of shares, I was extremely bullish, right? And you know, I would have been greedy if I had put in more than certain percentage of my wealth into Titan. And I didn't do it out of fear that Titan might not do well. I might lose my principal. Anuradha SenGupta: What about ACC? You sold ACC at lot less than what it actually went on to be?. Rakesh Jhunjhunwala: Ma'm, about markets, they say, either don't come to markets or don't regret what you have done. Right? Naya gilli, naya dao. I think the second quarter 1991 result was the best ACC produced for the next 10 years. And after those results came, I sold the shares. I bought them for 300 and within three months, I'd sold them for 3,500. And the price went to 10, 000. I've no regrets. Anuradha SenGupta: You have no regrets, but what principle drove you at that point, fear or greed? Rakesh Jhunjhunwala: I think I was neither being greedy nor being fearful, I was just being rational. Anuradha SenGupta: Celebrating three years of the bull run, the BSE Index has gone from 3000 plus to 12,000 plus in just three years. And this investor says, it's going to continue that way. Rakesh Jhunjhunwala: You know, Sensex has gone from 3000 to 12,000 in the last three years. You know people are excited, everybody's making money and that's why markets are making headlines. As they say Teji me sab ka bol bala, mandi me sab ka muh kala. Anuradha SenGupta: Every time the markets run up, people get extremely euphoric and they get very very nervous, isn't it? And you are the guy whom they run to defend the bull run? Rakesh Jhunjhunwala: There's no question of defending the bull run. See, we forget what markets are. Markets reflect economic truth and fundamentals. And I think India is going into a lot of unprecedented economic growth, I think the markets are only recognising that. Anuradha SenGupta: Why is it so difficult to believe what you are saying? Why is there this fear psychosis, that if things are good, then they are bound to go bad?. Rakesh Jhunjhunwala: I think for two reasons - past experiences and the inertia of the mind that India can have continued economic growth. And also because we've had two scams in the stock market, this also made people very suspicious of the markets. I think there is a combination of reasons. Anuradha SenGupta: Are you saying that we should not be suspicious at all this time round? Rakesh Jhunjhunwala: Well, I don't think there's a need to be suspicious, although I think you need to be alert. I don't think there's any scam in the market. Anuradha SenGupta: Now, in the past, in the secondary markets, where we've seen these two scams happen, the primary market has been a safer place for retail investors. Now it looks like the primary markets are also a suspect, isn't it? Rakesh Jhunjhunwala: Let us understand one thing that misuse of mechanisms is part of every market. All markets have to evolve. So therefore, we've to go to a stage of evolution where people are going to take advantage of the law. But law will catch up, right? Anuradha SenGupta: You have always defended the regulator very strongly saying that the regulator is in place and that regulator systems and processes are just fine. Do you stand by that? Anuradha SenGupta: See Ma'm, we may be critical of some mistakes that the regulator might have made, but we should realise that in the Indian stock markets, we have gone from the wild west to being one of the most modern trading system in the world. And in a very short span of time. Every regulator has to evolve. And mistakes are going to be made during evolution. So I think it's a matter of a glass being half full or half empty. Anuradha SenGupta: Ironically, while Jhunjhunwala has all the trappings of success, he still clings to his middle-class south Mumbai roots. Proud to be a self-made man, he can't help spouting Jhunjhunwala-isms. Anuradha SenGupta: What I want to know, how important is it for you that people are always guessing how much you are worth? It's important, isn't it, that people don't really know? Rakesh Jhunjhunwala: What irritates me, is how does it matter to them. And see, I am not running any relay race, I am not in any rat race with somebody and I want to be richer than somebody or I want to be the richest man. My purpose in life is to do what I enjoy and enjoy what I do, right? And wealth is a bi-product of what I do. Why do people want to know what my wealth is. How is it relevant? Anuradha SenGupta: Maybe only because your claim to fame is the money you made on your own, the first generation from scratch starting with Rs 5,000? Rakesh Jhunjhunwala: I think what is more needed to be appreciated is not the wealth I have as such but, how I made it. By God's grace, I am a rich man. How rich I am, how is it important? I can tell you one thing, I am rich enough for my wealth to matter internationally. Anuradha SenGupta: You just mentioned that you are not in the rat race, how do you react when you see these lists that come out - 100 richest men in the world, 100 richest Indians, 50 most powerful Indians? Because you have figured in some, haven't you? Rakesh Jhunjhunwala: Well, I have no press agent and I have no press agency, right? And I am not seeking any publicity. But as long as any list is a recognition of human effort and human achievement, then I would be lying if I said I don't like to be in that list. So, I like it to be there, but I am not making any special effort to be on this list. Being on the list is coincidental and not the purpose of my work. Anuradha SenGupta: Then obviously there's no ambition to be on any other list and on higher number on any list? Anuradha SenGupta: You have often and emphatically pointed out that there's a lot of research, a lot of data gathering and a lot of knowledge accumulation that goes into this business of yours. What do you read? Rakesh Jhunjhunwala: See, I read Economist and India Today, which I read cover to cover every week. In the Economist, I read the entire business section and the science and technology section. These are my constant reads. Then I read broker reports and go through balance sheets. Anuradha SenGupta: There are five screens here, could you quickly tell us which one does what? Rakesh Jhunjhunwala: Well, these are all of the BSE NSE live screens, where I track the prices. The first one right here is my investments. These are the futures. Anuradha SenGupta: There are 31 scripts there? Rakesh Jhunjhunwala: Yeah, except CL, all of them are my investments. These are all my shares in which I have some short-term positions. These are just some companies whose prices I want to follow. And these are the futures that I trade, right? This is the live Reuters screen, from where I get information. And this is the Internet. And there's the television. Anuradha SenGupta: Can you go through a single day without having, if you want to, conversations with anybody outside. Rakesh Jhunjhunwala: There are a certain people whose views I value, some friends with whom I discuss matters, so I talk to them. Essentially, the decisions in trading and investment are very lonely decisions. And I, of course, can trade without talking to anybody. But I do tend to talk to people. Anuradha SenGupta: You know I have spoken to a few people, who say there's a contradiction in Rakesh Jhunjhunwala. There's this long time view he has on some shares and he stays and he stays and he stays. Hangs in there, tight. And here on his trading screen, he can make and lose 20 crores or 50 crores in a blink. As we talk, can you do that? Rakesh Jhunjhunwala: Well, I don't do that kind of trading. I hold investments for a long time because I read somewhere and time has taught me that we should be greedy, but long term greedy. So, when you have something good, stick to it. Anuradha SenGupta: What about the other screen? Rakesh Jhunjhunwala: Ma'm, I had no capital when I came to the markets, and no father gifts and no father-in-law gifts. So I had to earn the capital to invest. How do you invest if you don't have the capital? And I got the capital by doing all this future trading. Anuradha SenGupta: And you can lose and make up to how much, say as we are talking? Rakesh Jhunjhunwala: I would not like to quote figures. I only make mistakes, which I can afford, where I can lift to begin again. Anuradha SenGupta: You get in actually before the trends start, isn't it? For the investment decisions?. Rakesh Jhunjhunwala: By God's grace, I think from 1985-86 to 2006, I had been able to catch most; say if there are 10 cycles in the market, then I have been able to catch 9 right. So investment wise, the cycles have been good. In trading, we make mistakes everyday. You know one author once said beautifully, that it's important that you are right or wrong in trading; it's important how much you lose when you are wrong and how much you make when you are right. Anuradha SenGupta: If you lose money, do you feel stressed? Rakesh Jhunjhunwala: No, never. I feel it for five minutes. Because Ma'm, I am not staking more than two or three percent of my wealth in these. I always remember Churchill's words. Anuradha SenGupta: You've quoted Churchill. You quote very regularly. Do you read anything else that these people have written? The non-investing legends. Rakesh Jhunjhunwala: Well, Churchill was not an investing legend at all. Anuradha SenGupta: Exactly. So, do you read beyond the quotes that have come in the books? Rakesh Jhunjhunwala: I am very fascinated by the Second World War. I have seen so many movies on the Second World War. I saw 25 CDs on the war and that gives you lot of quotes. Now, my non-market, non-economic reading is much lesser. I was a voracious reader before 35. Anuradha SenGupta: Even by international standards, your good wealth is what you sell. Does that mean you are ready to trade and to invest in international markets? What's stopping you? Is it legality or is it scale? Rakesh Jhunjhunwala: There are two to three reasons. First, even if I desire, I cannot do it because all my wealth is in India. By 2010, we will have capital ready. That's my guess. Second, the opportunity in India itself is so huge. And, so nascent. When we are getting good food at home, why think of a restaurant? And third, to invest at international scale, I need to build a bigger and broader organisation. I think I will have all the three by 2010. Anuradha SenGupta: What in terms of capital you need to invest to be considered of a notable investor? Rakesh Jhunjhunwala: I don't want to go into any market to be noted, I want to go there to make money. Anuradha SenGupta: So, capital is not a limitation? Rakesh Jhunjhunwala: No, capital is never a limitation. Anuradha SenGupta: You work with money. To put it very simplistically, where do you save your money? Rakesh Jhunjhunwala: Where do I save my money? Well, whatever I earn, less my expenses is my saving. Anuradha SenGupta: Away from the stock markets, are there any areas you would save your money - art, real estate? Rakesh Jhunjhunwala: No art really. I bought one painting last month. I have a house apart from this office, so no real estate either. I've invested in some real estate funds. Anuradha SenGupta: So what is saving for Jhunjhunwala? Rakesh Jhunjhunwala: My wealth is a valuable portfolio, that's my saving. Anuradha SenGupta: Can that be notional also because today depending on the markets, it's x today and goes down tomorrow? Rakesh Jhunjhunwala: I wouldn't say it's notional, it's fluctuating. Anuradha SenGupta: Doesn't it bother you sometimes that you are not the guy with the ideas; you are the guy who is backing the guys with the ideas? Rakesh Jhunjhunwala: I don't think so. There are various parts of creating anything. So when I invest in a company at an initial stage, I am handling with that company. I distinguish between my chairmanship of Aptech and my directorship of other companies. In Aptech, we are under management control of the company. So we are exactly running it. Anuradha SenGupta: What's the experience like? For you it's a new experience, isn't it? Rakesh Jhunjhunwala: It's a challenge, Ma'm. I don't know whether I will be successful. I will know in five years. But I love a challenge. Funds worldwide have made billions of dollars by taking over management control of companies. Now I had never taken management control of any company prior to Aptech. I think it will take 4 or 5 years. I still come to the year 2010. 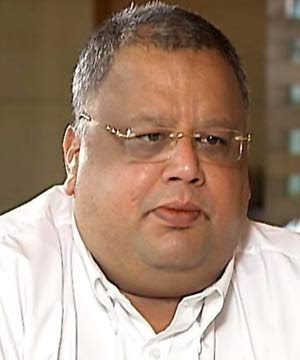 Anuradha SenGupta: Is 2010 a year when a lot of things will happen to Rakesh Jhunjhunwala? Rakesh Jhunjhunwala: Yes. I will be fifty that year. Rakesh Jhunjhunwala: I never said that. They are very flexible milestones. In a stock market, people come on CNBC and give targets. I think of targets but they are very flexible. If I succeed in reviving Aptech and we get a very good profitable company then I will get courage to buy management control of larger companies. Anuradha SenGupta: We talked about how markets are all the time on a bull run. And when Sensex keeps climbing, there is great excitement and fear. Does it bother you that people like you are scrutinised very intently at these times? Rakesh Jhunjhunwala: Ma'm, I am concerned about one thing. I follow the law in letter and spirit and we live in a democracy. I act in accordance with the laws in government institutions. Now if the government has a right to examine everything, whether we like it or not, we have to accept it. And that's part of life. Anuradha SenGupta: But this suspicion that comes up every time, especially in this business, does that bother you? Rakesh Jhunjhunwala: Not at all. Whatever I have done in life, people have looked on with suspicion. Imagine a chartered accountant in 1985 coming from a bureaucratic family, going to this stock market and standing on the streets. My father is a member of the Wellington club from 1973. I am a qualified chartered accountant. I don't think culturally I have done anything wrong. But they don't want to make me a member of Willington club. It's their choice. Initially, I used to react to this with anger. Now I react to it with maturity. People will have any opinion; time will change their opinion. Anuradha SenGupta: If you have made your money as a trader or investor in the stock market, somehow it is not as respectable as the captains of the industry? Does that bother you? Because you are putting in huge amounts of education and knowledge to make the kind of investments you are making? Rakesh Jhunjhunwala: Ma'm let me tell you one thing. Let me be very candid. For the kind of recognition I have got, I don't think it's not respected. It's now not respected in antique minds. If capitalism is the only method of government, then the only temples of that form of government are the stock markets. And believe me, I am not doing anything to be recognised by anybody. The recognition is incidental. I am doing what I enjoy to do. Anuradha SenGupta: But Rakesh, it bothers you enough today to remember the incident of Willington club not giving you membership? Rakesh Jhunjhunwala: But that maybe was 10-12 years ago when I might have felt a little pinch. Now I don't feel it. Jhunjhunwala chooses to live in a joint family. Without the economic and emotional support of his parents, he is clear that he would not have managed to throw a conventional career to the winds. His family including his sisters and brothers are the only people who benefit from his stock tips. Rakesh Jhunjhunwala: My dad is the person who has taught me the most in my life. And I think whatever I am in life, he has a very substantial contribution in it. He's the most democratic father. I had a curiosity and he has nurtured that curiosity. Anuradha SenGupta: So you are not a mummy's boy; you are a daddy's boy? Rakesh Jhunjhunwala: No, I am both mummy and daddy's boy. I am the baby of the family at 46. And the youngest tend to be both. I live with my parents and we are a very close-knit family. Anuradha SenGupta: You have a daughter, Nishtha. I remember hearing you say that you have several challenges in front of you; the first challenge is to be able to look after your health i.e., cut down on drinking, smoking, so that you can spend a minimum of 35 years with your daughter Nishtha. How are you doing on that challenge? Rakesh Jhunjhunwala: Well, I am just starting to work on it. Anuradha SenGupta: What I am quoting is what I heard two years ago. And you are still trying to work on it? Rakesh Jhunjhunwala: I think it's better late than never. Anuradha SenGupta: You are still trying to work on it? Rakesh Jhunjhunwala: Yes, and I will eventually. Anuradha SenGupta: But you are talking about 2010, you are talking about Nishtha, about parents who've supported you in your career choice and with who you live today out of choice. Surely it bothers them that you are not dealing with this challenge upfront and with the kind of effort that's needed? What do you have to say to them? Rakesh Jhunjhunwala: Well, I have no face to face them. Here I have lost a battle but I have not lost the war. Anuradha SenGupta: Ok, Rakesh Jhunjhunwala, on one of those stock quotes. I am going to wish you all the very best in this battle. And I hope that the markets continue to rise and nobody pays a price for it. Rakesh Jhunjhunwala: Well, that's a hope which may not be very legitimate, because in markets, some are going to win, some are going to lose. My hope would be to let India's economy prosper, let all Indians have at least basic needs. Let us build a society, which is egalitarian, where we allow people's skills to flow.